When Microsoft announced the Elite controller at E3, my ears immediately perked up. I've considered getting a custom controller for some time. I've perused various sites from Evil to SCUF and have always found the price to be prohibitively high, despite the numerous options available through each site. Not long ago, however, I bit the bullet and bought an Elite. 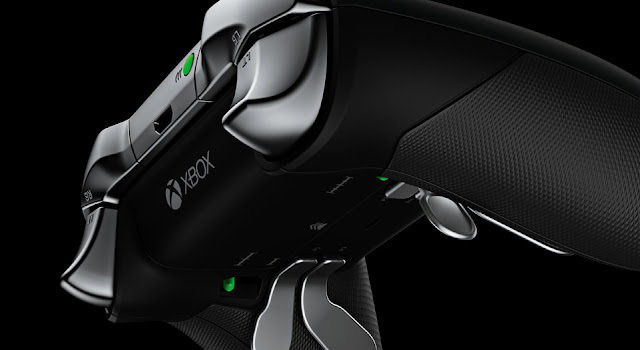 Here are my preliminary thoughts on Microsoft's first attempt at a high end controller. Right out of the gate I was nervous about the Elite. At $150, it's the most expensive gaming accessory I've bought to date. I waffled quite a bit on whether it was something that I could see myself using regularly or if it would just collect dust on a shelf. 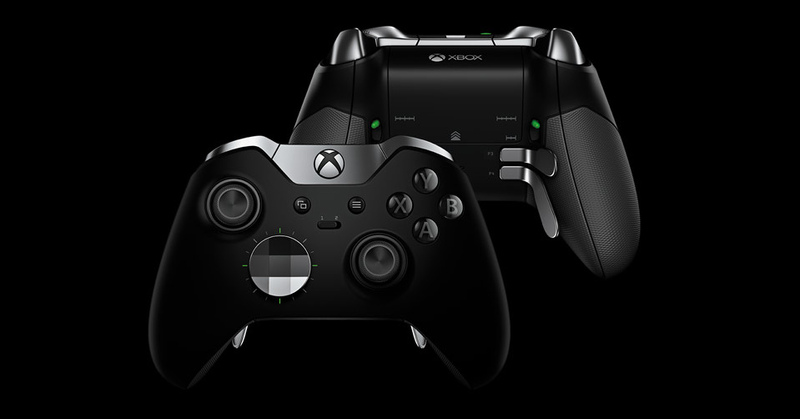 The price can be hard to justify, especially when you consider that it is roughly three times the cost of a standard XBox One controller. Indeed, you'll find the cost listed as a con for many reviews out there but I think a bit of context is in order. To the average player, $150 seems like a lot for a controller, but compare that to a controller with similar options through SCUF or Evil and you'll quickly see how competitive the Elite's price tag is. An Xbox One controller through SCUF will set you back over $200, while an Evil runs close to $300. Neither of them is known for being terribly reliable, with many owners complaining of frequent repairs and poor support. The Elite is significantly less expensive, comes with more out of the box customization ad has the added benefit of first party support. The build quality of the Elite is absolutely top notch. Several key components have been modified out to improve the feel and longevity of the device. The top of the controller, the thumbstick shafts, the D-pad and paddles are all steel rather than plastic. The rear grips are made from a texturized material formed onto the controller rather than glued and the surface has a softened finish to improve grip and comfort. These changes add weight the the Elite, making it more than 1/4 pound heavier than the standard XB1 controller. Some reviewers have said the weight makes it less comfortable to hold for long periods of time, but I like the added heft of the Elite. I find it to be one of the most comfortable controllers I've ever owned (nothing beats the old Gamecube controller). A good view showing the textured grips, reconfigurable paddles and the green hair trigger locks. The level of customization on the Elite really makes it shine. It comes with three different thumbsticks (normal, medium height domed, and tall concave pairs) to allow better ergonomics for different sized hands and to provide greater control of the sticks for FPS and racing games. The D-pad is also interchangeable, with a standard cross and a faceteted disk. The disk seems well suited for use in fighting games where precise movements and speed are utmost. The four paddles on the back can be removed or reconfigured in almost any way, making it easier to find a comfortable setup. 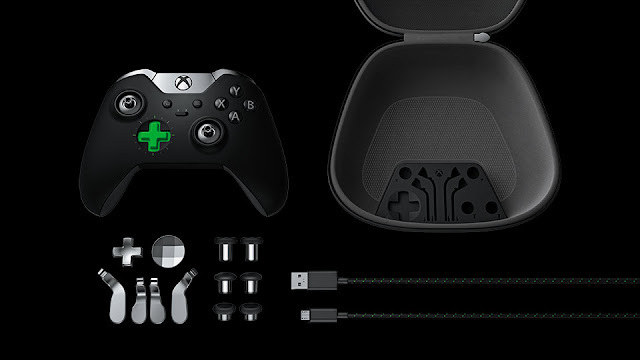 All of the swappable parts are firmly held with magnets and require no tools to install or remove, nor do they use any flimsy locking tabs, significantly reducing wear on the controller and its parts. The extra parts fit snugly into the formed silicone block inside the included case. The only issue I've had with this is fitting the USB cord inside without pressing buttons on the controller. The mesh pocket in the top of the case doesn't have much clearance, but the cord does fit well on top of the silicone block. Everything in the image is included with the Elite. None of it is purchased separately. 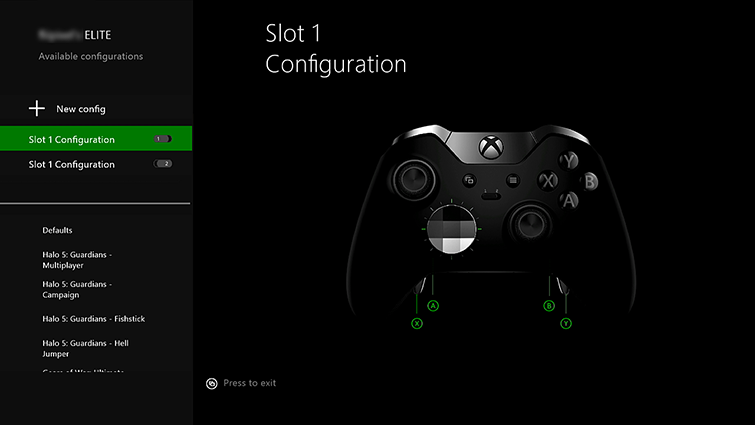 Almost every button on the controller can be easily remapped through the intuitive Xbox accessories app. The app can run concurrently with any game, allowing you to remap controls on the fly. I play Titanfall quite a bit and have mapped my jump, weapon swap and sprint buttons to the rear paddles and reassigned the melee button to A. If, in the middle of a match, I decide the setup doesn't work for me, I can launch the accessories app and reconfigure the buttons in less than a minute. The app can store 256 different configurations and the controller stores two internally and can instantly swap between them with the selector button in the middle of the controller. The rear triggers can be set to a hair trigger with the flip of a couple switches on the back. Everything in the Elite is built to be changed and remapped quickly. The accessories app offers a lot of control in a very straightforward interface. The Elite offers a high degree of control over the triggers within the app, allowing you to individually change the max and minimum threshold distance, and even swap the triggers. I tested the triggers with the Forza 6 demo and found that setting a lower max threshold allowed me to accelerate noticeably faster. Similarly, the thumbsticks can be swapped, their sensitivity adjusted, and the axes flipped. The four vibration motors can also be adjusted individually to be more or less severe, though I haven't found much use for it. I am simply blown away by the Elite. The amount of control and customization available to me, coupled with the incredible quality of the components is more than enough to justify the price tag. It is a joy to use and modify and though time will really tell the difference, I feel that my Titanfall performance has already improved. If you're at all considering a custom controller for the XB1 or PC, I would recommend the Elite over anything else out there. You won't find a better controller for serious gaming at any price.